My baby turned two this week. I was reading through my journal and looking at pictures of Emilia's 2nd birthday. She seemed so much bigger than Stella does. Although I know Stella is a toddler now, I still think of her as a baby. Stella and her Grandma Vicky share the same birthday. For the past two years we have hosted a family dinner at our house to celebrate both birthdays. Todd's parents, siblings and a cousin who lives in town came with their families. We had 23 people total to celebrate with us. Stella was a bit confused by the presents. She has had a lot of practice helping others open their gifts so she just kept leaving the box on my lap and going back to get another one. It took her a few minutes to realize that what was inside was intended for her. Blowing the candle was a bit confusing for her too. Thank goodness for uncle Scott, who could show her how to do it. 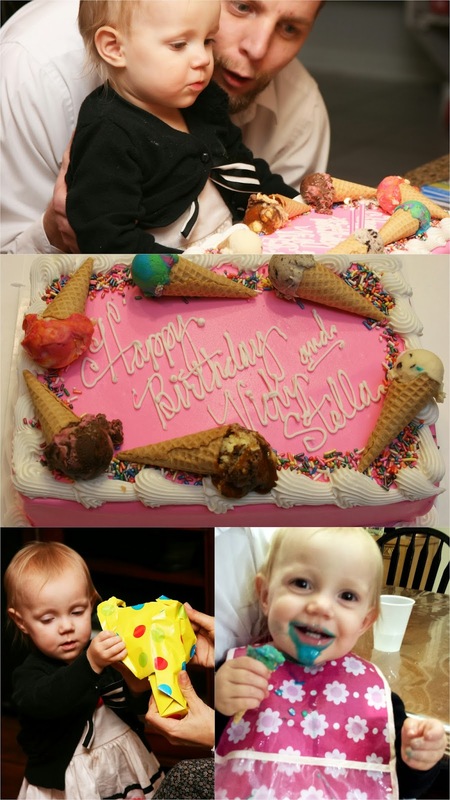 The ice cream cake that Grandma and Grandpa picked out was a hit with all the kids. Each of the little ones go to pick their own cone. Stella's blue sherbet made her really happy. Stella's favorite words and expressions are Whoa!, Hot Dog, Sippy Cup, Juice, Nona, Mommy (whenever she wants something), and Here You Go. These are just a few of the words she speaks. She is good at repeating what we say and knows how to say Daddy, Carson, Emilia, and Arthur as well. Stella is also quite the eater. She eats more than her two older siblings at any meal, primarily because she will eat whatever we offer. Her favorite foods are hot dogs and chocolate milk. I love her little balloon belly. Happy birthday Stella Bella! We all love you very, very much!